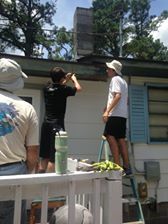 Lance shared his painting expertise on a mission trip with 21 youth from West United Methodist Church. 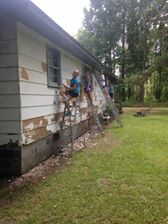 They scraped, replaced boards, replaced glass in a few windows, painted window trim, shutters, the body of the house, and sweated A LOT. 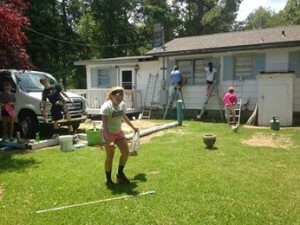 The youth learned new skills and shared their time and talents to improve the home of a Wilmington resident. Lance, the youth, and the homeowner were all blessed! I still own my first car, a 1965 convertible Mustang. She and I both turn 49 this year. I am the youngest of three children and my daddy, Tom Keels, was a Ford Dealer in Marshville, NC when I was growing up. Daddy gave each of his children a car built the year we were born. My brother got a 1955 Army Jeep. My brother named his Jeep “Iron Possum” because it was long, grey, and ugly. He could pile all his friends (and then some) in it and go mud-bogging. My sister got a 1957 Ford Galaxy 500. She named her car “Black Thunder” because it was big, black, loud, and indestructible. She tried many times to wreck it. One day, the brakes gave out as she was driving into Daddy’s dealership. His dealership was located down an embankment off Highway 74. She came down the hill wide open and had to keep circling the building until the car slowed down. My 1965 Mustang has always simply been called “Joycelyn’s Mustang.” The car just seemed to fit me. I cruised that little car through our town all the time with my best friend riding shot gun. There wasn’t much else for a teenager to do in Marshville. Daddy used to love to tell the story of seeing us cruise through town, as usual, but on one particular afternoon, we had our boyfriends with us. Daddy would laugh and explain that we were in the front but made the boys sit in the back. After all, we knew our friendship would endure through the years. Those boyfriends were just for a summer and they didn’t mind a bit! Disappointments in life are many times blessings in disguise. You see, I really wanted a NEW car when I turned 16. Daddy was a car dealer, and I thought, surely he would let me have a new car. Daddy had a wonderful sense of humor and thought the tradition of buying his children a car built the year they were born should continue. Needless to say, I was disappointed. However, my daddy passed away in 2009 and I still own a part of his legacy through my car. What a blessing to be able to have a tangible memory! Just because something is old doesn’t mean it is not of value. This is true in people and things. My Mustang was worn out before I even got it. My sweet brother has restored it twice for me. It continues to break down and wear out but, just as we do for each other, we repair, patch, encourage and keep driving! You need to get out on the highway every once in a while and “open her up.” Occasionally, my car needs to be driven as fast and as hard as she will go to keep her in top running condition. The same is true of us; sometimes we need to be stretched to our limits to keep us sharp and strong. You can’t let your car sit in the garage too long. The worse thing you can do is NOT drive your car. We all need to leave the garage and get on the road of life. Proverbial “sitting still” is not healthy. No seatbelts and no airbags will make you drive a bit more cautiously. In driving this car and in life, having no safety nets makes you aware of your surroundings, an almost hyper alertness to danger. I am always a little scared while driving this car but that makes me more careful. A little caution is not always bad. When you ride in a convertible, your hair is going to get messed up – that is part of the experience. So many times in life, we are trying to keep up appearances and miss the fun of letting our hair down and truly experience life’s ride! It is nice to be valued, not by beauty or wealth, but simply because you have endured and become a “classic.” My little car is not of any great value to anyone but me. She has endured much, just as we all do in life, but she keeps rolling! She is a little scary at times, always fun to watch, and she keeps teaching me what is most important in life! 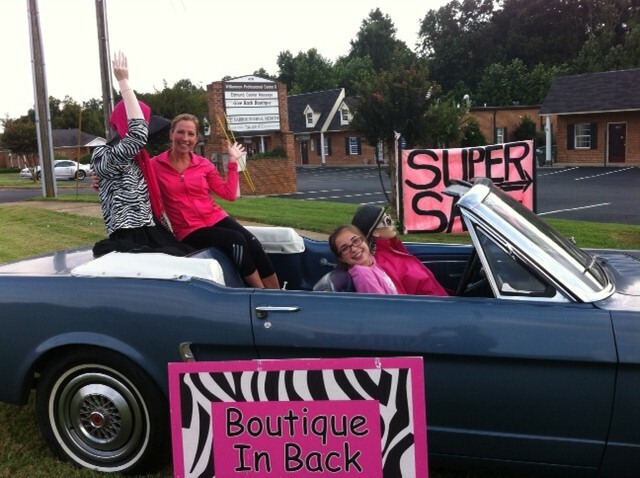 You may see Joycelyn’s Mustang at the Give Back Boutique advertising for a sale or rolling down a Mooresville road. If you see her, wave! 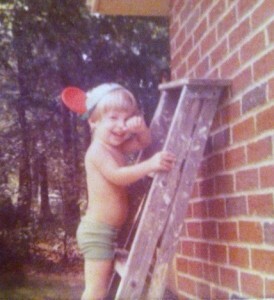 Armstrong Painting – The Early Years! Lance Armstrong, owner of Armstrong Painting, has been painting for a long time! He put himself through UNC Charlotte by painting and after earning a BA in English with a minor in Communications, joined his mother in selling real estate. He now operates Armstrong Painting with a team of outstanding, experienced painters, and sells homes through Lake Norman Realty. Following in his mother’s entrepreneurial footsteps, he has successfully manged both aspects of painting and real estate. Blues, greens, and grays are named as the 2013 design colors by Furniture/Today online consumer survey. The Pantone Color of the Year is Emerald Green 17-5641. Sherwin Williams 2013 Color of the Year is Aloe SW6464. Sherwin Williams “Aloe” paired with caviar blacks, crisp whites or soft grays, gives it a mid-Century appeal. Aloe paired with natural textiles, aged metals, or wood tones give it a more tranquil feel. 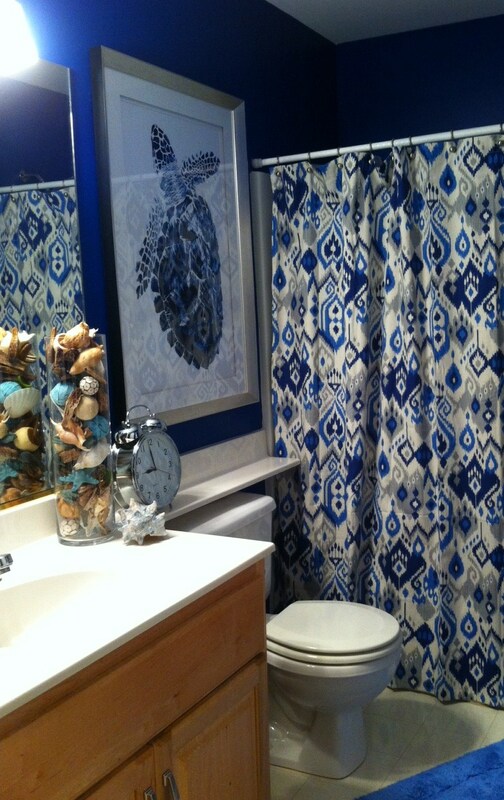 Popular shades of blue include navy, turquoise, peacock, teal, cobalt, blue-gray, pale blue and robin’s egg blue. 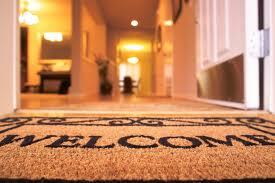 Grays are the second most popular and is described as the “new beige.” It is described as neutral but not boring. 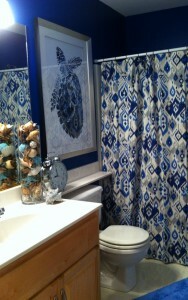 Here is our son’s bathroom in Sherwin Williams Blueblood SW6966.